Stem cells, which can be derived from different sources, demonstrate promising therapeutic evidences for cellular therapies. Among various types of stem cell, mesenchymal stem cells are one of the most common stem cells that are used in cellular therapy. Human subcutaneous adipose tissue provides an easy accessible source of mesenchymal stem cells with some considerable advantages. Accordingly, various preclinical and clinical investigations have shown enormous potential of adipose-derived stromal cells in regenerative medicine. Consequently, increasing clinical applications of these cells has elucidated the importance of safety concerns regarding clinical transplantation. Therefore, clinical-grade preparation of adipose-derived stromal cells in accordance with current good manufacturing practice guidelines is an essential part of their clinical applications to ensure the safety, quality, characteristics, and identity of cell products. 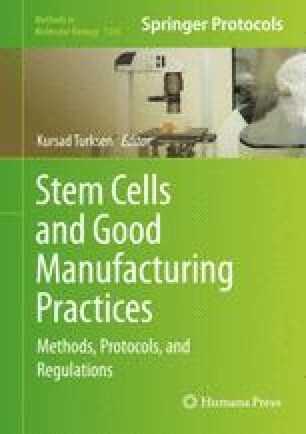 Additionally, GMP-compliant cell manufacturing involves several issues to provide a quality assurance system during translation from the basic stem cell sciences into clinical investigations and applications. On the other hand, advanced cellular therapy requires extensive validation, process control, and documentation. It also evidently elucidates the critical importance of production methods and probable risks. Therefore, implementation of a quality management and assurance system in accordance with GMP guidelines can greatly reduce these risks particularly in the higher-risk category or “more than minimally manipulated” products. This work was supported by Brain and spinal Cord Injury Research Center, Tehran University of Medical Sciences (research grant # 85/2160). The authors would like to acknowledge Dr. Abbas Norouzi-Javidan, Dr. Seyed Majid Manavi, Dr. Ramin Heshmat, and Dr. Mohsen Khorshidi for their considerable assistance. We also thank Hanieh Rostam Abadi, Shokouh Salimi, Faezeh Nouraei, and Maryam Kavousi.